Minister of Planning and Investment Nguyen Chi Dung and Cambodian Minister of Planning Chhay Than co-chaired the 8th ministerial-level meeting in Phnom Penh on February 23. The event aimed to assess the cooperation between the two ministries and effective implementation of commitments and instructions of the two countries’ high-ranking leaders in 2016, looking towards celebrating the 50th anniversary of bilateral diplomatic ties in 2017. During the meeting, the two sides noted with pleasure that the two ministries’ cooperation in the past years, especially in 2016, contributed to boosting social-economic development and strengthening the traditional relationship between Vietnam and Cambodia. They agreed that despite changes in world and regional situation, with efforts from both sides, agreements between the two governments have been implemented effectively and witnessed significant outcomes. The two countries have coordinated in removing difficulties hindering land border demarcation and marker planting. In 2016, two-way trade reached about US$2.8 billion and nearly one million tourists travelled cross border. Vietnam continued providing aid of VND290 billion (US$13 million) for Cambodia to develop education and training, including 1,090 scholarships worth VND171 billion (US$7.7 million). 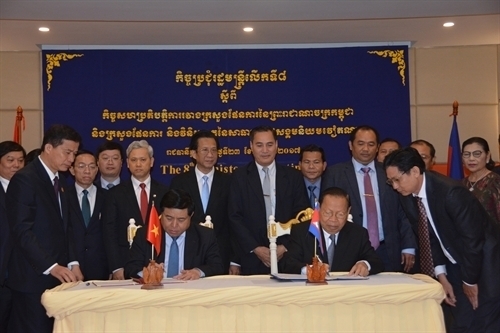 With regard to cooperation in 2017, the two sides agreed to further cooperation in planning, in which Vietnam will assist Cambodia in training, surveying and data collection to calculate GDP for some provinces in the Cambodia-Laos-Vietnam development triangle. They also consented to speed up the drafting of the joint agreement on connecting Vietnamese and Cambodian economies to submit to the two governments for approval. From this year, the two ministries will hold annual deputy minister-level meetings to boost collaboration and the sharing of experience and professional knowledge. During his stay in Cambodia, Minister Dung paid a courtesy visit to Deputy Prime Minister Hor Namhong.